Jean Guy was born on March 15, 1930 in Sturgeon Falls, Ontario, the son of Albert and Oliva Delorme (dit Lemay). He was baptized in Sacred Heart parish. He grew up in a large family. He was the last child born, the "baby" of the family. Some of his nephews were older than him!! Their home was located on the corner of Levesque and John streets. It was a large 2 storey wooden house with an attachment. In the back was a large garden. When I was a child in the early 60s, it was a vegetable and flower garden beautifully maintained by Euclide Délorme, Oliva's brother who had lived there for several years. Jean Guy lived in a household where his mother worked as a seamstress and a furrier. She had a work area on a landing on the left side at the top of the stairs. His father worked for a lumber company as a surveyor and was gone for several months at a time. Sadly he passed away in 1942 when Jean Guy was 12 years old. Uncle Euclide (Oliva's brother) had a farm near Sturgeon Falls. Dad recalls they would sometimes help on the farm, like real laborers!! They would thin out rows and rows of carrots. Loved eating the young shoots. They'd also helped at harvest time. As young boys, Jean Guy and his brother, Lionel would also work at Uncle Euclide's lumber camp. He would get horses by the carload from the West. He'd keep the best ones and sell the others. Lionel and Dad would skid the logs with these horses. Once, Uncle Euclide caught Lionel and Jean Guy in the woodshed. They were smoking rolled up corn silk. Euclide took the two of them to the front parlor of the house, a forbidden zone. Only on special occasions with guests was it EVER used. He told them "If you're going to smoke, you're going to smoke like men!". He gave them each a Cuban cigar and made them smoke the WHOLE thing. They both got sick!! At 15 years of age, with winnings from a bingo jackpot, Jean Guy left for Toronto. He left the $2.50 his mother had given him to play on her sewing machine. With what remained of his $110 winnings, he took a bus to Toronto and went to stay at his Uncle Anatole's son Lucien's place. Eventually he was found out. He was put on a bus back home. 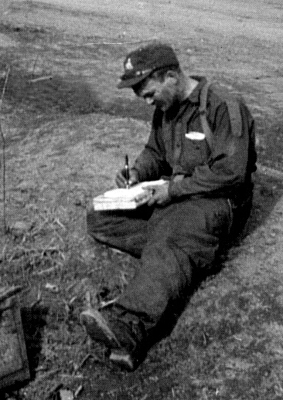 At one point as a teenager he was working in a lumber camp (Espanola TVP - Talimazoola Vegetable Parchment) in Northern Ontario. He came down to Montreal with a guy who'd worked with him in the camp. They stayed at his friend's uncle's place. He was the manager of the kitchen at the Queen's Hotel, a top Montreal hotel at the time! When the man's niece came back, making his room no longer available, he told Jean Guy he could stay in a room off the garage at the hotel. This is how he got a job at the Queen's as a car jock in 1947. He had a second job at the time as an apprentice at Huge Brenton Auto Tops where he made canvas convertible tops. In early 1950, Jean Guy took off with four others to motorcycle down to Mexico. One of the guys was a Dr. Brown. They wouldn't let them across the border because they didn't have suitable I.D. They decided to head for Toronto and all join the army BUT Jean Guy was the only who got in - #6 Depot in Toronto - August 18, 1950. Stationed in Val Cartier near Quebec City, he met Jeanne d'Arc Cinq Mars on a blind date. Giselle Cinq Mars, the daughter of Philippe Cinq Mars and Anne Blanchet was going out with a friend of Dad's, Roméo Minor from Sturgeon Falls. He went to Fort Louis in Washington state to do basic training before going to Korea. While working as a bartender there, he met Prince Philip, husband of Queen Elizabeth II. He was in Korea in 1951 with the 2nd Battalion Van Doos. He came back from Korea in 1952 to take a parachuting course. He was serving with the Royal 22nd Regiment at the time. 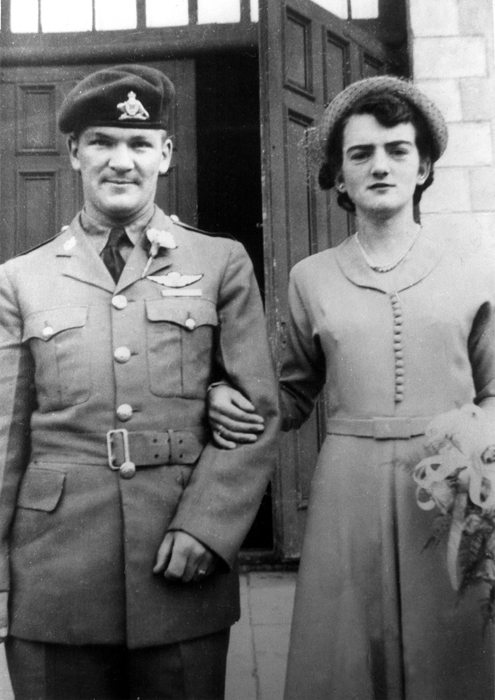 He married Jeanne d'Arc in St. Louis de Lotbinière on August 2nd 1952. Captain Therien married them. 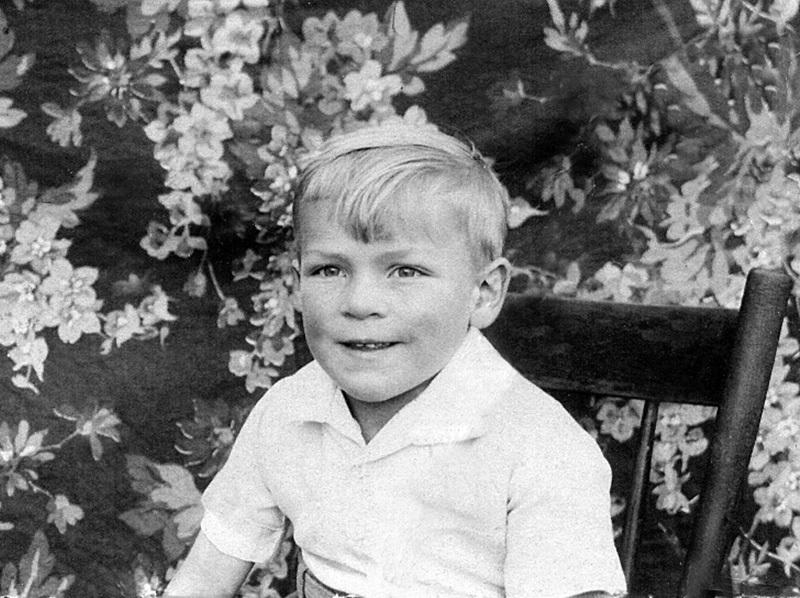 He later baptized four of his children, Fran and Mike in Val Cartier and later, Yvette and Yvonne in Germany. After his wedding, Jean Guy was stationed at Val Cartier an army base near Quebec City. Jeanne d'Arc and he lived in Quebec City on 3rd Avenue in the parish of Saint Francois d'Assise. They lived in this city for about 5 years. While they were here their fisrt two children were born, a son Michel and a daughter, Francine. In 1958, Jean Guy was transferred to Germany for a couple of years. The family lived in Werl in Westfalia. They resided in an army base there. In 1959, Jeanne d'Arc gave birth to twin daughters, Yvette and Yvonne. The return trip to Quebec by ship was a memorable with two 10-month-old girls, washing lots of cloth diapers and Jeanne d'Arc and Francine enjoying bouts of seasickness. The next two years were spent at Camp Petawawa near Pembrooke, Ontario. In 1961, after 11 years serving in the Armed Forces, Jean Guy left the army. I should mention here that those years were spent with Jean Guy working as a tailor like his mother before him and like his ancestor, Guillaume Daoust. Many of his siblings had also worked in the trade. I was told by a fellow sister of the Congregation des Soeurs de la Sagesse, that Sister Germaine was not a tailor but "an artist"!!! Out of the army, Jean Guy and his young family moved to the paternal house in Sturgeon Falls, Ontario. They resided in the annex part of the house. Jean Guy worked with his mother at the family trade. Nicole, the "baby" of the family was born here in 1961. 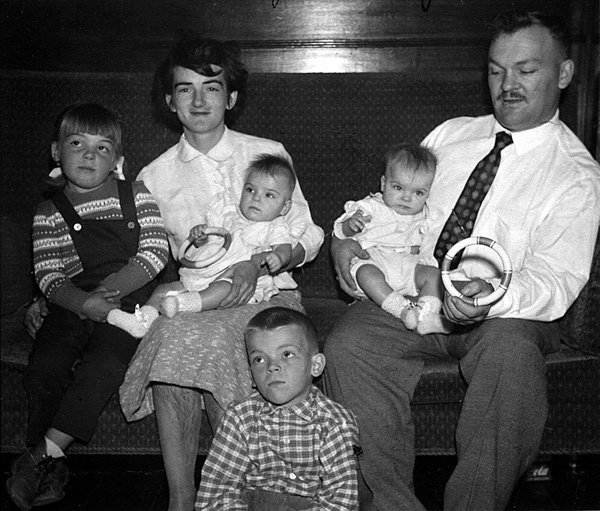 In May 1963, the family relocated to Trenton, Ontario where his brother, Lionel lived. They were to live in this southern Ontario town until 1967. During these years, Jean Guy switched occupations. He worked as an upholsterer and furniture refinishing and painter. Every summer had the visits of Cécile (Jeanne d'Arc's sister), her husband Bernard and her young family - sunny summer days spent at the beaches of Lake Ontario!! Another move occurred but this time back to our Daoust family roots in Montreal; the summer of the World`s Fair "Expo 67" was an exciting time to come back! Jean Guy would spend the rest of his life here. Jack-of-all-trades, he worked as a window/drapery maker, a furniture spray painter then an automobile painter for several years and finally in his later years, a security guard. The last years of his life were difficult ones. The many years of exposure to toxic fumes played havoc with his lungs and in consequence he was forced to use an oxygen machine. He still managed to be full of life and good cheer. He greatly enjoyed his family and his grandchildren and even a great-grandchild. In 1997, he celebrated his 45th wedding anniversary. 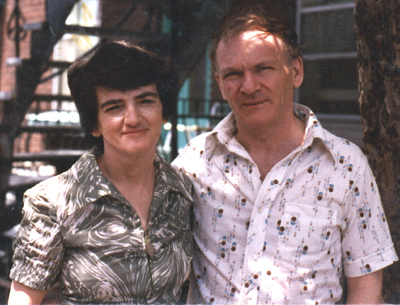 One can say in conclusion that he was a man who greatly loved his wife and who was always joking around. His children, Mike and Fran started tracing the family genealogy during his last year. He loved every new discovery. He was especially thrilled when he was told that Guillaume Daoust, resident of Ste Anne de Bellevue had known Mathurin Guillet, one of his wife's ancestors three hundred years before - their coming together was in the stars! His mother, always known as a Delorme was discovered to be "Delorme dit Lemay"...well the grandmother of Jeanne d'Arc was Emma Lemay. Common ancestry - it was destiny, he said. On Sunday morning, February 4th 2001, he passed away. The funeral service was held in the church of Notre-Dame-des-Sept-Douleurs in Verdun, where he had lived for several years. He was laid to rest in the Field of Honor in Pointe Claire. Full circle for our family - he rests close to Lake Saint Louis where his ancestor, Guillaume Daoust had lived.